Join Pir Zia Inayat-Khan, spiritual leader of the Sufi Order International, for a weekend of Sufi teachings and practices that will help you awaken your mystic heart. You will learn how to use conscious breath, sacred sounds, movement, prayer and meditation in your journey towards this goal. Registration for Awakening Your Mystic Heart is available through our online registration page, but drop-in registrations just before the event begins at the Noor Cultural Centre are welcome too. Registration opens at 8:30am on Saturday (event begins at 9am), and at 9:30am on Sunday (event begins at 10am). One-day registration is available also, at a highly discounted rate. If you’d like to help promote the Awakening Your Mystic Heart event, a poster is available here, and a postcard here. If you wish to help provide scholarships to those who need financial assistance to attend this event, please use this SOI Toronto Centres donation page. Merging Oceans: The Art, Music & Spirit of Mughal India. Saturday, May 2, 6-9:30pm, at the Aga Khan Museum and Ismaili Centre, Toronto. Please join us for a celebration of Mughal India. Explore two special exhibitions at the Aga Khan Museum, “Visions of Mughal India” and “Inspired by India” and enjoy a concert by Justin Gray of Indian Classical Music performed on an exciting new hybrid instrument, the Bass Veena. This will be followed at the Ismaili Centre, Toronto, by a talk and conversation with Sufi teacher Pir Zia Inayat-Khan titled “The Sufi & Hindu Encounter in Mughal India” which will explore the inter-cultural and inter-spiritual gifts, and legacy of remarkable tolerance, from this important historic era. Professor Narendra K. Wagle will moderate the conversation. Please visit our event page for Merging Oceans for more details. Merging Oceans is an additional event, and is not included in the registration for Awakening Your Mystic Heart, but registrants receive a code to use for discounted tickets. 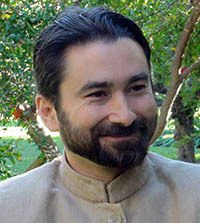 Pir Zia Inayat-Khan is a scholar and teacher of Sufism in the lineage of his grandfather, Hazrat Inayat Khan. He is the president and spiritual leader of the Sufi Order International and founder of Seven Pillars House of Wisdom. He established the Suluk Academy, a school of contemplative study with branches in the United States and Europe. Pir Zia holds a doctoral degree in Religion from Duke University, is a recipient of the U Thant Peace award, and is a Lindisfarne Fellow. His book Caravan of Souls: An Introduction to the Sufi Path of Hazrat Inayat Khan was published in 2013, and his book Saracen Chivalry: Counsels on Valor, Generosity and the Mystical Quest was published in 2012. Over a century ago, the musician and mystic Hazrat Inayat Khan (1882-1927) brought Sufism from his native India to the West. Traveling, teaching and initiating seekers across the United States and Europe, he sowed the seeds of a world movement. Now, as President of the Sufi Order International, Pir Zia Inayat-Khan continues his grandfather’s work of catalyzing authentic spiritual development. Spirituality is the tuning of the heart. One can obtain it neither by study, nor by piety. The Sufi Order International is an egalitarian, non-denominational spiritual group whose mission is to spread the Message of Unity and promote the awakening of humanity to the divinity in all. Sufism is an ancient path of spiritual development rooted in the traditions of Islam but inclusive of all spiritual traditions. 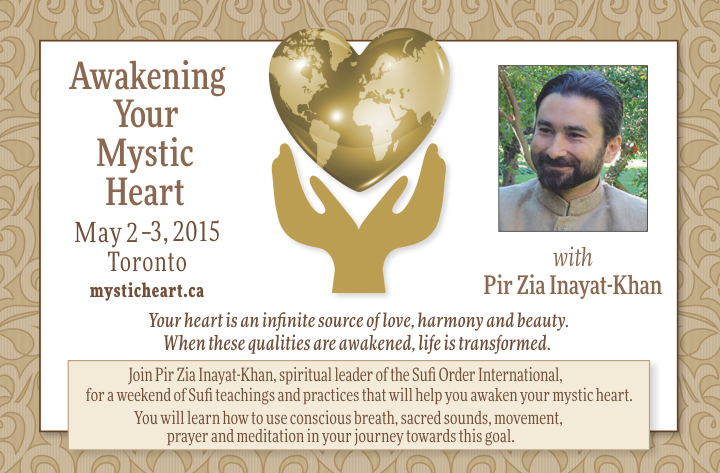 This event is sponsored by the Awakening Heart Circle, a Sufi Order International centre in Toronto. 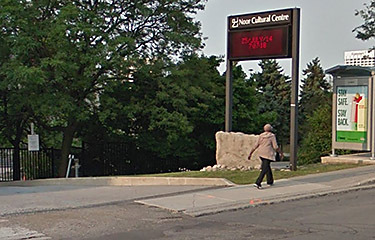 The Noor Cultural Centre is located on the south side of Wynford Drive just east of the Don Valley Parkway. A map showing the locations of all the venues for Pir Zia’s events this weekend is online here (Spirited Climate Change @ UofT Multi-Faith Centre; Merging Oceans @ Aga Khan Museum and Ismaili Centre, Toronto; Awakening Your Mystic Heart @ Noor Cultural Centre). By Car, Southbound: Take the Don Valley Parkway (DVP), exit at Wynford Drive, and turn left. Shortly after you cross over the Parkway, the Centre is located on your right. By Car, Northbound: Take the Don Valley Parkway (DVP), and exit at Eglinton Avenue East. Turn left onto Eglinton Avenue, turn right at the first light onto Don Mills Road, then take the first right onto Wynford Drive. Follow Wynford and, shortly after you cross over the Parkway, the Centre is located on your right. By Public Transit: Take the the 100 Flemingdon Park bus from either the Eglinton or Broadview TTC Stations. It runs frequently and stops right in front of the Centre (123 Wynford Drive, or Wynford Dr. at Concorde Place west side). Where to Stay: We’ve created a map showing some Toronto hotels you might consider. The Toronto Don Valley Hotel & Suites is only a few minutes drive from the event venue. Where to Eat: You’ll need to find dinner on Saturday evening after that day’s workshop sessions are over and before the Merging Oceans event begins at 6pm at the Aka Khan Museum. We’ve created an online map of many restaurants all within about 5 minutes drive from the Noor Cultural Centre and Aga Khan Museum. Certainly, the heart of flesh is not the heart which is the depth of man’s being. But the heart of flesh, being directly in focus to the inner or real heart, reflects in its turn that which happens to be in the inner heart. It is, therefore, that this piece of flesh is called “heart,” it being the only factor which represents the heart within. May 2, Saturday morning and afternoon. 9am–4:25pm. Day 1 of the Awakening Your Mystic Heart workshop retreat. On-site registration (drop-ins welcome!) opens at 8:30am. A vegetarian lunch with gluten-free options will be provided. May 2, Saturday evening. 6pm–9pm. Merging Oceans: The Art, Music & Spirit of Mughal India. Explore two special exhibitions at the Aga Khan Museum, “Visions of Mughal India” and “Inspired by India” and enjoy a concert by Justin Gray of Indian Classical Music performed on exciting new hybrid instrument, the Bass Veena. This will be followed at the Ismaili Centre, Toronto, by a talk and conversation with Sufi teacher Pir Zia Inayat-Khan titled “The Sufi & Hindu Encounter in Mughal India” which will explore the inter-cultural and inter-spiritual gifts, and legacy of remarkable tolerance, from this important historic era. Professor Narendra K. Wagle will moderate the conversation. Please visit our event page for details. May 3, Sunday morning and afternoon. 10am–5pm. Day 2 of the Awakening Your Mystic Heart workshop retreat. On-site registration (drop-ins welcome!) opens at 9:30am. A vegetarian lunch with gluten-free options will be provided. The mind is the surface of the heart, and the heart is the depth of the mind. Please register for the Awakening Your Mystic Heart workshop retreat using our online registration form here. Some brief event details are below. … neither a distinct religion nor a doctrine. It does not require adherence to prescribed dogma or ritual and welcomes all races, nations and beliefs. It has existed through out all the centuries in many forms and cultures. It is a way of looking at living in the world. It emphasizes bringing one’s highest ideals into the events of everyday life. It is a way for humanity to awaken to the abundance of life individually and collectively.